Show them the world is watching. Stop the Hollyweb. Join these activists and take your own photo at a W3C office near you. UPDATE: we've received many images, and activists are organizing a demonstration at the W3C's Amsterdam office to parallel the one we are holding at the central office in the US. Read more. For years, Defective by Design and the anti-DRM movement have been fighting Hollywood and proprietary software companies who want to weave Digital Restrictions Management into the HTML standard that undergirds the Web. Winning this is a top priority for us -- the DRM proposal, known as EME (Encrypted Media Extensions), would make it cheaper and more politically acceptable to impose restrictions on Web users, opening the floodgates to a new wave of DRM throughout the Internet. We've been calling this awful possibility the Hollyweb -- a network riddled with restrictions that serves Hollywood, not its users. 1: Sign our petition to demand that the W3C reject the Encrypted Media Extensions proposal, and keep DRM out of Web standards. 2: Send the W3C a protest selfie. The W3C makes standards for the World Wide Web, so it is important to them to demonstrate that they represent the interests of people everywhere. We need to show them that people around the globe believe in a Web without restrictions. 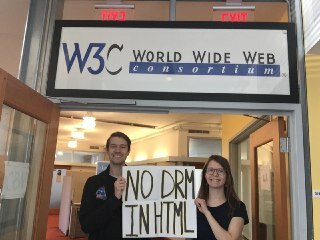 Take a selfie with a sign protesting DRM in HTML in front of a local landmark or skyline, or even one of the 20 global W3C offices (addresses for USA's and Japan's and all others). Try our printable sign if you're not feeling creative. We have reliable advice that this will be very influential to the W3C's leadership -- if they know the whole world is watching them, it will be much harder for them to take this huge step backward for the Web. Please send your pictures to campaigns@fsf.org and post them on social media with the hashtag #hollyweb. To put pressure on the W3C leading up to its big meeting, make sure to send us your photos by Thursday, March 17th. Photos sent to us will be shared under a Creative Commons Attribution 4.0 International license, so please provide the attribution you would like listed, or if you would like to remain anonymous, please state that you wish for no attribution. We'll share your photos in an online gallery and on March 20th, we'll incorporate them into a demonstration outside the central W3C office at the Massachusetts Institute of Technology. (Yes, this is the second day of the Free Software Foundation's LibrePlanet conference -- and serendipitously, the conference and W3C office are in the same building!) If you'd like to preserve anonymity, we're happy to blur your face. We're also seeking leaders to take it one step further and organize a demonstration at any global W3C office this month. We'll provide support with logistics, resources and promotion. Let us know at campaigns@fsf.org if you'd like to work with us! We have a real chance to win this fight. Many of the W3C's hundreds of member organizations and staff members stand with us in opposition to DRM in HTML. A few giant companies, like Microsoft, Netflix, and Google, are driving the push to add DRM to the HTML standard -- because they're beholden to Hollywood and big media to lock down their video streams. This comes down to a simple question, which has repercussions beyond just DRM: will we have a Web designed for big media companies and Hollywood -- the Hollyweb -- or a Web that works for the billions of people around the world that rely on it to communicate, connect and organize? For more information about DRM in HTML, see the coalition letter we co-signed with 26 other organizations arguing against the proposal, the Electronic Frontier Foundation's blog post on the subject, and the full text of the proposal itself. Together, we will stop the Hollyweb!